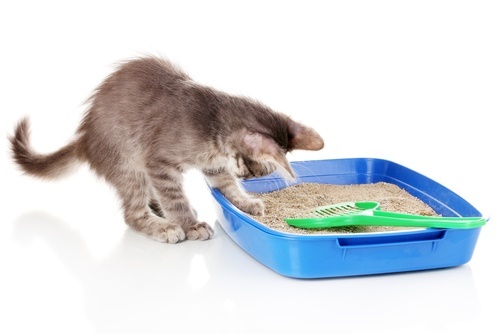 While kittens can benefit from the same kind of cat litter as larger cats, their habits with that litter can be very different. They may play in it or even ingest it, and that can be dangerous if the litter contains harmful chemicals, as many types of cat litter do. That’s why it is important to choose the right kind of litter for your kitten. You want something that will effectively get rid of smells, be easy to clean up and yet be safe for your kitten. We are going to show you 10 different cat litter products that we believe are the best on the market. It’s time to have a closer look at our picks for the best cat litter for kittens. There are other options out there, but we chose these because of their high quality and suitability for kittens. 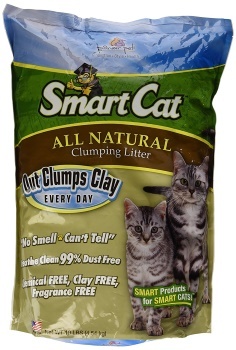 This litter is good for little cats because it contains no fragrances, dyes or other harmful chemicals. Yes, those things are useful for keeping smells away and allowing the litter to be easy to clean up, but they are bad for your cat, and you may need to make some sacrifices until your kitten becomes more mature. It’s still a decent litter, and it clumps very well and does a decent job of eliminating odors. 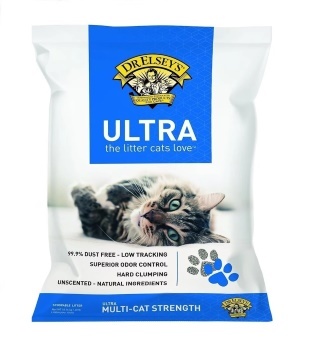 It’s also a pretty much dust free litter, and it is made from natural substances that are designed to be safe for your cat and for the environment. 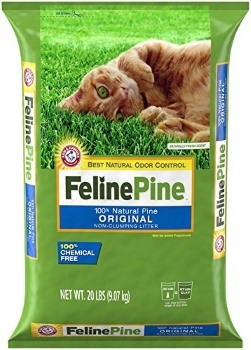 This is one of the most well-known and well-regarded cat litter products available. It is superb at clumping and it does a great job of getting rid of odors. It’s practically dust free, and it is made to be safe for your cat. The manufacturers only use natural components when making this litter, and that makes it a good choice for kittens. However, it can be one of the pricier options, and in this case, you are definitely getting what you pay for. This flushable, environmentally safe cat litter can be used for cats of all ages. Just be aware that if your cat plays with the litter, it can stick to their fur and be tracked through the house. 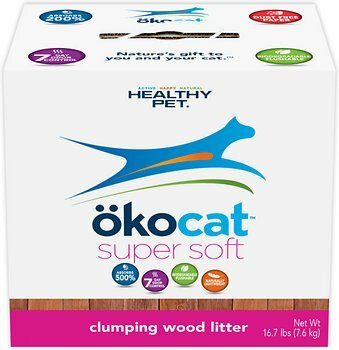 The clumping litter formula used by ökocat makes it a quick and easy job to clean up the litter. You can often just scoop out the spot where the cat used the litter box and then leave the rest of the litter for at least a week. 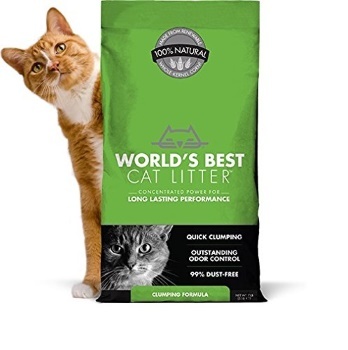 This is a natural litter product as well, and you don’t have to worry about your cat ingesting toxins, but of course eating too much of this can be dangerous. The price is great, and the odor control is some of the best on the market, but your cat can still track it through the house. It’s not that there is a lot of dust created with this litter, but cats can get it stuck to their fur and carry it around with them unknowingly. This is an incredibly safe litter to use for kittens. 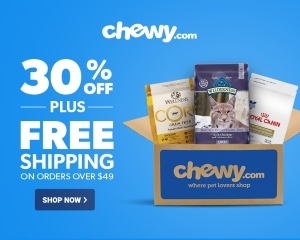 The hypoallergenic formula means that it won’t trigger any allergies, and the natural ingredients ensure that it is as safe as can be for cats that try to eat it. However, the new formulation used for this product makes it a bit of mess sometimes. While you won’t have to be concerned about your cat tracking dust all through your house, you do need to watch for when the litter becomes sticky and muddy and starts to cling to your cat’s fur. This can happen pretty quickly, and you need to be aware of it. 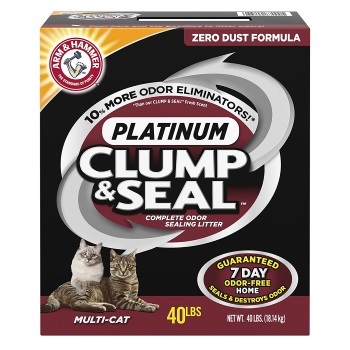 There are few products on the market today that can get rid of litter box odors as fast and as effectively as Arm & Hammer’s clumping litter. It uses a patented technology that seals in odors as they manifest and eliminates the bacteria that causes odor, creating a protective shield from bad smells in your home. This is also a litter that clumps very well, forming very hard clumps that are so easy to remove. On top of all that, it is priced affordably, so you can handle multiple cats at a low price and not have to worry about dust tracking or bad odors. The only negative we can put onto this review is that the odor eliminating fragrance has a strong lemon smell to it that may be unpleasant for either you or your cat. This litter is made from pine, which makes it pretty safe for cats and ensures that they are unlikely to try to eat much of it. It’s also designed to be great at absorbing cat urine and blocking odors. However, the fragrance used to stop cat odors has a strong scent of its own. If your cat has a sensitive nose, then it may not use the litter box. 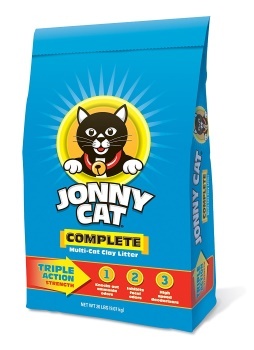 If you are looking for something cheaper than what we have shown you already, then Jonny Cat litter could be right for you. It’s very inexpensive, but it still works fairly well. It’s not as consistent as some of the other products on our list, but it is still decent for its price. If you are trying this with your cat after using a different kind of litter before, then Cat Health suggests introducing it in small portions to let your cat acclimate to it. 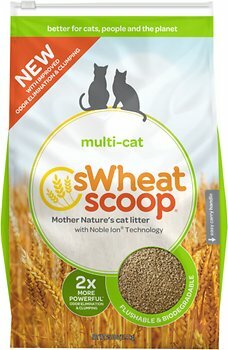 For those households where there are multiple cats running around, sWheat offers a great option. It’s a litter with powerful odor control, and it is made from natural components that include no dyes or fragrances. So, it’s safe for your cat to use and even play around with. However, there is still the risk that excessive ingestion will cause stomach issues. The natural components mean that it is biodegradable, and it should be easy to get rid of. However, you do not want to flush it down the toilet. 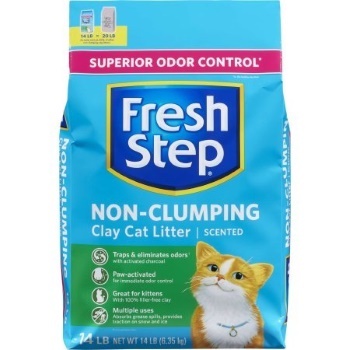 What makes Fresh Step’s litter so unique and such a good option is that it is excellent at neutralizing odors on the spot, but it doesn’t leave a lasting fragrance. The odor eliminating scents only activate when the litter is moved around and the litter box is in use. So, you and your cat don’t have to smell the powerful fragrance all day long. This is also a litter that doesn’t clump, so your cat is less likely to play with it. However, that also means that there will be some dust tracking in your home, and it means that it will be harder to clean up the litter when your cat is done using it. This is another non-clumping option, and it does a very good job of killing odors on contact. Of course, that comes with a price, and the scent it releases can be kind of strong and not very pleasant for animals with sensitive noses. Your cat may or may not take to this litter, and you want to introduce it a little bit at a time. 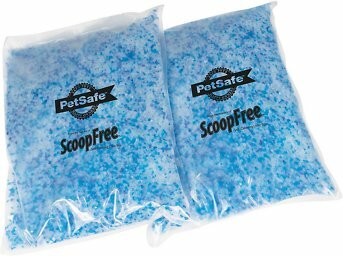 PetSafe has released this as a dual-package product, which means that you only need to open one bag at a time and you get to keep the other bag fresh and safe. Clumping litter isn’t always the best option– Cat litter that clumps together is something that kittens love to play with it, and if they start to play with it, then they will likely try to eat it, according to Petful.com. While clumping litter may be convenient for you and make for easy cleanup, it poses the highest risk of ingestion for your cat. Some types of litter are safer than others– There are a few different kinds of litter, and certain natural litter materials are much safer than other kinds. You can buy litter that is made from clay, paper, wood, wheat and other substances, and knowing your cat’s allergies and what they are sensitive to will help you make the right choice. Silica litter is best for older cats– While silica litter is very popular, if your cat is less than four months old, then ingesting a lot of this can be really bad for their digestive system, says TheNest.com. Wait until your kitten is a bit older to allow them to use silica-based cat litter. Talk to your vet– If you have concerns about allergies or about your cat’s litter habits and you are not sure what to do and what litter to buy, then you probably want to to talk to your veterinarian. Find out what their recommendation is to ensure you make the right decision. Now that you have seen our choices for the best kitten litter, we hope that you can find something that works well for you and for your cat with in your budget. Please let us know if we can provide you with any more information to help you make the right choice for cat litter.